HEY US GOVERNMENT! Tables in PDF documents aren't "Open Data." Please provide machine-readable formats or it doesn't count. 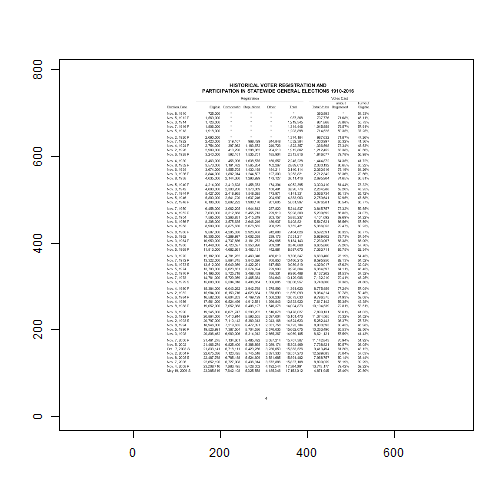 What can we do about such data other than extract it by hand? One answer is rely on tabulizer a package I submitted to rOpenSci that reduces some and often all of the hassle of extracting tabular data locked inside PDFs. Tabula is an extremely powerful tool for extracting tabular data locked in PDFs. It’s an incredibly valuable tool because the PDF file specification does not have a “table” representation. Instead, PDFs simply represent tables through the fixed positioning of text into rows and columns. Thus, unlike HTML, Word (.docx), or Open Document (.odt) file formats, there is no easy programmatic way to identify a table in a PDF. Tabula thus implements novel algorithms for identifying rows and columns of data and extracting them. tabulizer just provides a thin R layer on top of this power Java code. If a PDF is a scan of a document or the table is actually an image embedded in the PDF, tabula - and thus tabulizer - are useless. In those cases, users might want to check out the OCR functionality of tesseract, which Jeroen Ooms developed for rOpenSci and discussed previously on this blog. But it does mean that a substantial amount of difficult-to-parse tabular information in PDFs is now readily and quickly accessible via just one tabulizer function: extract_tables(). tabulizer is not yet on CRAN. (It’s CRAN-ready but due to some underlying developments that are ongoing in the tabula-java library, I’m waiting for a formal release.) In the meantime, it’s possible to install tabulizer directly from GitHub. Install the Java Development Kit, if you don’t already have it on your system. (Note that the JDK is different from the Java Runtime Environment (JRE) that you almost certainly already have.) Details of how to do this vary a lot between platforms, so see the README for details. Install rJava using install.packages("rJava") and resolve any issues surrounding the JAVA_HOME environment variable that may need to be set before and/or after installing rJava. Again, see the README or various question/answer pairs on StackOverflow for platform-specific instructions. This should work. If not, set verbose = TRUE in ghit::install_github() to identify the source of any issues. Some common problems are the dependency on the png package, which might need to be installed first. On Windows (depending on your version of R and how it was installed) may require setting INSTALL_opts = "--no-multiarch" in ghit::install_github(). If none of these steps work, scroll through the GitHub issues page for anyone experiencing a similar problem and, if not resolved in any of those discussions, feel free to open an issue on GitHub describing your problem including the fully verbose output of install_github() and your sessionInfo(). Elections data are the bread and butter of a lot of quantitative political science research. Many researchers in my field need to know how many citizens voted and for whom in order to make sense of campaigns, election integrity, partisanship, and so forth. Yet a substantial amount of election-related data is locked in government-produced PDFs. Worse, national, state, and local governments have little to no standardization in the formatting of elections data, meaning even if one could figure out a computational strategy for extracting one kind of data about elections in one year from one state, that computational strategy would likely be useless in the same state in another year or in any other state. Elections provide a fantastic and highly visible example of “open” government data that’s not really open or usable at all. ##  [6,] "Nov. 8, 1910"
##  [7,] "Nov. 5, 1912 P"
##  [8,] "Nov. 3, 1914"
##  [9,] "Nov. 7, 1916 P"
## [10,] "Nov. 5, 1918"
##  [1,] "HISTORICAL VOTER REGISTRATION AND"
##  [2,] "PARTICIPATION IN STATEWIDE GENERAL ELECTIONS 1910-2016"
##  [3,] "Registration Votes Cast"
##  [5,] "Eligible Democratic Republican Other Total Total Votes Registered"
##  [6,] "725,000 * * * *393,893*"
##  [7,] "1,569,000 * * * 987,368 707,776 71.68%"
##  [8,] "1,726,000 * * * 1,219,345 961,868 78.88%"
##  [9,] "1,806,000 * * * 1,314,446 1,045,858 79.57%"
## [10,] "1,918,000 * * * 1,203,898 714,525 59.35%"
Figuring out columns positions and/or table areas is quite challenging to do by hand, so the locate_areas() provides an interactive interface for identifying areas. It returns lists of coordinates for specific table areas. A higher-level function, extract_areas(), connects that GUI directly to extract_tables() to return the tables within specified areas. Two other functions can be useful in this respect: get_n_pages() indicates the number of pages in a PDF and get_page_dims() indicates the dimensions of the pages. ##  "4Election Date Eligible Democratic Republican Other         Total Total Votes\r\nTurnout \r\nRegistered\r\nTurnout \r\nEligible\r\nNov. 8, 1910 725,000 * * *             *    393,893              * 54.33%\r\nNov. 5, 1912 P 1,569,000 * * * 987,368 707,776 71.68% 45.11%\r\nNov. 3, 1914 1,726,000 * * * 1,219,345 961,868 78.88% 55.73%\r\nNov. 7, 1916 P 1,806,000 * * * 1,314,446 1,045,858 79.57% 57.91%\r\nNov. 5, 1918 1,918,000 * * * 1,203,898 714,525 59.35% 37.25%\r\nNov. 2, 1920 P 2,090,000 * * * 1,374,184 987,632 71.87% 47.26%\r\nNov. 7, 1922 2,420,000 319,107 968,429 244,848 1,532,384 1,000,997 65.32% 41.36%\r\nNov. 4, 1924 P 2,754,000 397,962 1,183,672 240,723 1,822,357 1,336,598 73.34% 48.53%\r\nNov. 2, 1926 2,989,000 410,290 1,298,062 204,510 1,912,862 1,212,452 63.38% 40.56%\r\nNov. 6, 1928 P 3,240,000 592,161 1,535,751 185,904 2,313,816 1,846,077 79.78% 56.98%\r\nNov. 4, 1930 3,463,000 456,096 1,638,575 150,557 2,245,228 1,444,872 64.35% 41.72%\r\nNov. 8, 1932 P 3,573,000 1,161,482 1,565,264 162,267 2,889,013 2,330,132 80.65% 65.22%\r\nNov. 6, 1934 3,674,000 1,555,705 1,430,198 154,211 3,140,114 2,360,916 75.19% 64.26%\r\nNov. 3, 1936 P 3,844,000 1,882,014 1,244,507 127,300 3,253,821 2,712,342 83.36% 70.56%\r\nNov. 8, 1938 4,035,000 2,144,360 1,293,929 173,127 3,611,416 2,695,904 74.65% 66.81%\r\nNov. 5, 1940 P 4,214,000 2,419,628 1,458,373 174,394 4,052,395 3,300,410 81.44% 78.32%\r\nNov. 3, 1942 4,693,000 2,300,206 1,370,069 150,491 3,820,776 2,264,288 59.26% 48.25%\r\nNov. 7, 1944 P 5,427,000 2,418,965 1,548,395 173,971 4,141,331 3,566,734 86.13% 65.72%\r\nNov. 5, 1946 5,800,000 2,541,720 1,637,246 204,997 4,383,963 2,759,641 62.95% 47.58%\r\nNov. 2, 1948 P 6,106,000 2,892,222 1,908,170 261,605 5,061,997 4,076,981 80.54% 66.77%\r\nNov. 7, 1950 6,458,000 3,062,205 1,944,812 237,820 5,244,837 3,845,757 73.32% 59.55%\r\nNov. 4, 1952 P 7,033,000 3,312,668 2,455,713 229,919 5,998,300 5,209,692 86.85% 74.07%\r\nNov. 2, 1954 7,565,000 3,266,831 2,415,249 203,157 5,885,237 4,101,692 69.69% 54.22%\r\nNov. 6, 1956 P 8,208,000 3,575,635 2,646,249 186,937 6,408,821 5,547,621 86.56% 67.59%\r\nNov. 4, 1958 8,909,000 3,875,630 2,676,565 200,226 6,752,421 5,366,053 79.47% 60.23%\r\nNov. 8, 1960 P 9,587,000 4,295,330 2,926,408 242,888 7,464,626 6,592,591 88.32% 68.77%\r\nNov. 6, 1962 10,305,000 4,289,997 3,002,038 239,176 7,531,211 5,929,602 78.73% 57.54%\r\nNov. 3, 1964 P 10,959,000 4,737,886 3,181,272 264,985 8,184,143 7,233,067 88.38% 66.00%\r\nNov. 8, 1966 11,448,000 4,720,597 3,350,990 269,281 8,340,868 6,605,866 79.20% 57.70%\r\nNov. 5, 1968 P 11,813,000 4,682,661 3,462,131 442,881 8,587,673 7,363,711 85.75% 62.34%\r\nNov. 3, 1970 12,182,000 4,781,282 3,469,046 456,019 8,706,347 6,633,400 76.19% 54.45%\r\nNov. 7, 1972 P 13,322,000 5,864,745 3,840,620 760,850 10,466,215 8,595,950 82.13% 64.52%\r\nNov. 6, 1973 S 13,512,000 5,049,959 3,422,291 617,569 9,089,819 4,329,017 47.62% 32.04%\r\nNov. 5, 1974 13,703,000 5,623,831 3,574,624 729,909 9,928,364 6,364,597 64.11% 46.45%\r\nNov. 2, 1976 P 14,196,000 5,725,718 3,468,439 786,331 9,980,488 8,137,202 81.53% 57.32%\r\nNov. 7, 1978 14,781,000 5,729,959 3,465,384 934,643 10,129,986 7,132,210 70.41% 48.25%\r\nNov. 6, 1979 S 15,083,000 5,594,018 3,406,854 1,006,085 10,006,957 3,740,800 37.38% 24.80%\r\nNov. 4, 1980 P 15,384,000 6,043,262 3,942,768 1,375,593 11,361,623 8,775,459 77.24% 57.04%\r\nNov. 2, 1982 15,984,000 6,150,716 4,029,684 1,378,699 11,559,099 8,064,314 69.78% 50.45%\r\nNov. 6, 1984 P 16,582,000 6,804,263 4,769,129 1,500,238 13,073,630 9,796,375 74.93% 59.08%\r\nNov. 4, 1986 17,561,000 6,524,496 4,912,581 1,396,843 12,833,920 7,617,142 59.35% 43.38%\r\nNov. 8, 1988 P 19,052,000 7,052,368 5,406,127 1,546,378 14,004,873 10,194,539 72.81% 53.51%\r\nNov. 6, 1990 19,245,000 6,671,747 5,290,202 1,516,078 13,478,027 7,899,131 58.61% 41.05%\r\nNov. 3, 1992 P 20,864,000 7,410,914 5,593,555 2,097,004 15,101,473 11,374,565 75.32% 54.52%\r\nNov. 2, 1993 S 20,797,000 7,110,142 5,389,313 2,043,168 14,524,623 5,282,443 36.37% 27.73%\r\nNov. 8, 1994 18,946,000 7,219,635 5,472,391 2,031,758 14,723,784 8,900,593 60.45% 46.98%\r\nNov. 5, 1996 P 19,526,991 7,387,504 5,704,536 2,570,035 15,662,075 10,263,490 65.53% 52.56%\r\nNov. 3, 1998 20,806,462 6,989,006 5,314,912 2,665,267 14,969,185 8,621,121 57.59% 41.43%\r\nNov. 7, 2000 P 21,461,275 7,134,601 5,485,492 3,087,214 15,707,307 11,142,843 70.94% 51.92%\r\nNov. 5, 2002 21,466,274 6,825,400 5,388,895 3,089,174 15,303,469 7,738,821 50.57% 36.05%\r\nOct. 7, 2003 S 21,833,141 6,718,111 5,429,256 3,236,059 15,383,526 9,413,494 61.20% 43.12%\r\nNov. 2, 2004 P 22,075,036 7,120,425 5,745,518 3,691,330 16,557,273 12,589,683 76.04% 57.03%\r\nNov. 8, 2005 S 22,487,768 6,785,188 5,524,609 3,581,685 15,891,482 7,968,757 50.14% 35.44%\r\nNov. 7, 2006 22,652,190 6,727,908 5,436,314 3,672,886 15,837,108 8,899,059 56.19% 39.29%\r\nNov. 4, 2008 P 23,208,710 7,683,495 5,428,052 4,192,544 17,304,091 13,743,177 79.42% 59.22%\r\nMay 19, 2009 S 23,385,819 7,642,108 5,325,558 4,185,346 17,153,012 4,871,945 28.40% 20.80%\r\nHISTORICAL VOTER REGISTRATION AND\r\nPARTICIPATION IN STATEWIDE GENERAL ELECTIONS 1910-2016\r\nVotes CastRegistration\r\n5Election Date Eligible Democratic Republican Other         Total Total Votes\r\nTurnout \r\nRegistered\r\nTurnout \r\nEligible\r\nNov. 2, 2010 23,551,699 7,620,240 5,361,875 4,303,768 17,285,883 10,300,392 59.59% 43.74%\r\nNov. 6, 2012 P 23,802,577 7,966,422 5,356,608 4,922,940 18,245,970 13,202,158 72.36% 55.47%\r\nNov. 4, 2014 24,288,145 7,708,683 5,005,422 5,089,718 17,803,823 7,513,972 42.20% 30.94%\r\nNov. 8, 2016 P 24,875,293 8,720,417 5,048,398 5,642,956 19,411,771 14,610,509 75.27% 58.74%\r\nNotes\r\n* Indicates information not available. 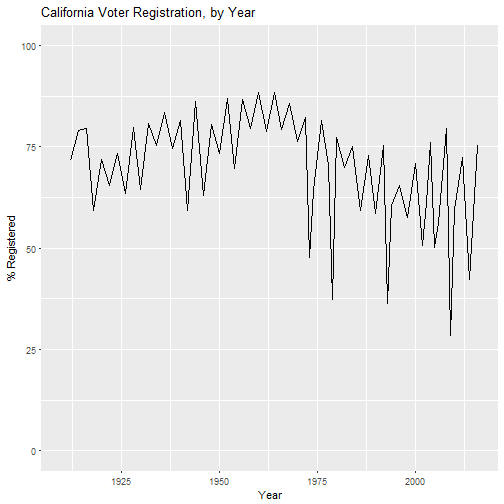 \r\nIn 1911, women gained the right to vote in California.\r\nIn 1972, the voting age was lowered from 21 to 18.\r\nRegistration Votes Cast\r\nP indicates a presidential election year.\r\nThe first statewide record of party affiliations was reported in 1922.\r\nHISTORICAL VOTER REGISTRATION AND\r\nPARTICIPATION IN STATEWIDE GENERAL ELECTIONS 1910-2016 (continued)\r\nS indicates a statewide special election.\r\n"
##  $ title   : chr "Statement of Vote - General Election, November 8, 2016"
##  $ subject : chr "Statement of Vote - General Election, November 8, 2016"
##  $ keywords: chr "Statement of Vote - General Election, November 8, 2016"
##  $ creator : chr "Acrobat PDFMaker 11 for Excel"
##  $ producer: chr "Adobe PDF Library 11.0"
##  $ created : chr "Fri Dec 16 18:54:13 GMT 2016"
##  $ modified: chr "Fri Dec 16 18:54:44 GMT 2016"
And, lastly, the split_pdf() and merge_pdf() functions can extract specific pages from a PDF or merge multiple PDFs together. Those functions should find multiple uses cases beyond the challenges of working with other peoples’ data. tabulizer can’t solve all your PDF problems. More likely than not you’ll at some point encounter a PDF that contains scanned tables or tables that tabula-java’s algorithms can’t identify well. But for a wide array of well-formatted PDF tables, tabulizer should provide a much simpler and much faster initial extraction of data than attempting to transcribe their contents manually. As always, the issue tracker on Github is open for suggestions, bug reports, and package support. Pull requests are always welcome. Help of any kind on these issues will be very useful for getting the package ready for CRAN release! Many, many thanks to the Tabula team who have done considerable work to make the tabula-java library on which tabulizer depends. I also want to express considerable thanks to David Gohel and Lincoln Mullen for their feedback during the rOpenSci onboarding process, which resulted in numerous improvements to the package and its usability, not least of which is the interactive shiny widget. Thanks, too, to Scott Chamberlain for overseeing the review process and to the whole of rOpenSci for their support of the R community.